One of the areas the Digital Research Team (DRT) are actively seeking to have impact is inspiring the next generation of researchers. In addition to recently running a hackathon with students during of digital research week, we have also directly been engaging with students as a part of their undergraduate courses. As a part of the degrees offered by Computer Science (CS), second year students take a team-project based module. They are randomly placed into teams of 6 and tasked with completing a technology-based project using a professional software-development methodology. A unique element of these projects are the role of industry partners who, working with Computer Science supervisors, propose project ideas that the student teams pitch for. This not only introduces a client element to the projects, but also ensures the projects address relevant and real-world challenges. The DRT run a series small-scale innovative projects called digital initiatives designed to explore, inspire and challenge research. As a part of our strategy to inspire, we funded the purchase of a novel and ground-breaking motion capture technology with a view to explore the possibilities. 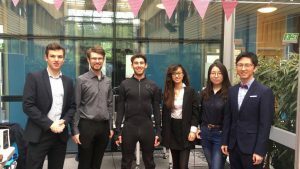 Acting as an industry partner and working with Dr Martin Flintham, the DRT proposed a student project with the technical challenge of using the motion capture suit and the latest virtual reality technology (Occulus Rift) to support a home yoga practice. The principle idea was to have a virtual yoga demonstrator who the user could observe in VR, and attempt to imitate the yoga postures. Using the accelerometer sensors in the suit, the user’s limb and body movement could be tracked and the yoga demonstrator able to provide intelligent and real-time feedback. The project sought to cover multiple disciplines, including Health and Wellbeing, Human Computer Interaction and Business Development. Multiple student groups pitched for the project in a dragon’s den style presentation, and one team was selected: made up of Della Sam, Alexander Nicholls, Ben Furman, john Mercer, Yuxuan Guo and Zimeng Shuang. The team initially elicited the core requirements for the project from the DRT, and then set about creating a proof-of-concept. We gave the team some early feedback which they took on board, and went on to complete the project over a 6-month period. 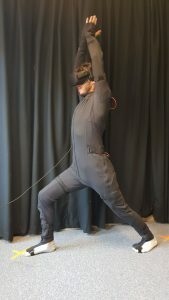 To use the system, users put on the motion capture suit and a personalised profile is created based on their height and limb lengths in order to calibrate the sensors. They then put on the VR headset and are presented from a first person point-of-view a 360o virtual yoga studio, a real-time digital version of their own body and a life-size virtual yoga demonstrator. The user is presented with a series of different options on the style of yoga (i.e. Hatha, Ashtanga) and the studio location (i.e. Mountain Range, Beach) in the form of large floating circles. To select an option, they physically move their arm inside one of the circles and hold for 5 seconds. 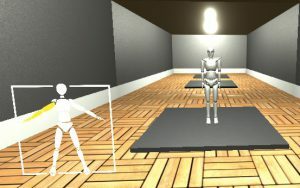 A pre-determined programme of postures and movements are then demonstrated and narrated by the virtual yoga demonstrator. 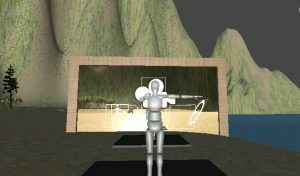 The animations are based on pre-recorded actions made using the suit, so are based on accurate real-world movements rather than animated estimations. The user then attempts to emulate the yoga demonstrator posture. 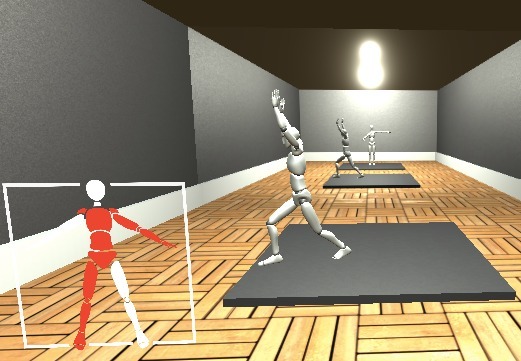 A real-time comparison is made between the positions of the users body/limbs against the demonstrators, and the user is informed of any inconsistency via a highlighting the limbs on a floating 2D model. This helps the user to correct their body position, and take part in an effective and safe self-practice. The project was demonstrated, alongside 40 other student teams, as part of a large showcase event held on May 16th in Computer Science. Each project was assessed and rated by a panel of industry-based judges, with prizes for the best overall project and the best code. We are proud to share that the team successfully won the prize for best overall project. This is well deserved given the teams hard work, technical skills and creativity. They even took up Yoga in their own time in a bid to better understand the application domain. There is much research potential for this work, and indeed for the application of the technology in other disciplines such as Sports Science and Injury Rehabilitation. We have thoroughly enjoyed supporting and working with team, and look forward to opportunities for challenging new groups of students next year.